Christmas is indeed a time for fun and cheer. You’ll see people buying Christmas gifts, hampers and Christmas tree decorations and ornaments as the Christmas day approaches. They sure spend lot for christmas stuff like gift baskets and Christmas hampers. that’s aside from expenses for ornaments and decorations. Let’s trim down the expenses by creating homemade Christmas ornaments. From here, you can use fresh Christmas craft ideas for kids to create different ornaments. It is necessary to have complete ability for your Christmas crafts. You may be looking for how to make a santa craft or how to make a scrapbook. Whatever may be I hope this will help you to reach exactly what are those factors to consider for some basic and easy Christmas craft ideas. This is the best way to get into the perfect crafting. 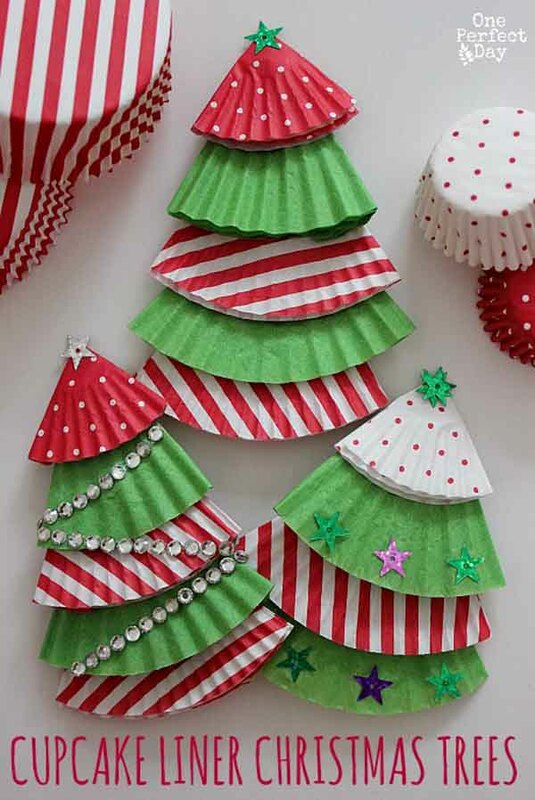 These cupcake liner Christmas tree ornaments are not just easy to do but also earth-friendly. It is colorful and shows your fun quirky side. Glitters, sequins and other art materials serve as your embellishments. Your kids would sure be proud of showing off your Christmas tress to every guests in the house. These Christmas trees are not just fun to make but are also easy to do. You create the tree with either making a paper mache or recycling styrofoam cups. To make the leaves, use different style and colors of crate paper to make it livelier and fun. Stick the petals of crate papers onto the tree in a linear manner. Decorate your place with this easy and fun Christmas wreath. All you need are some red and green construction papers as your materials. The kids can roll the paper themselves. Lend them some hand on stapling the ribbons and berries made out of the red construction paper. These Christmas tree ornaments are definitely simple and fun to make. They are also sturdy enough to last for the next Christmas. Strips of cardstock would be the perfect paper of choice. Use metal eyelet kits to bind the strips together. 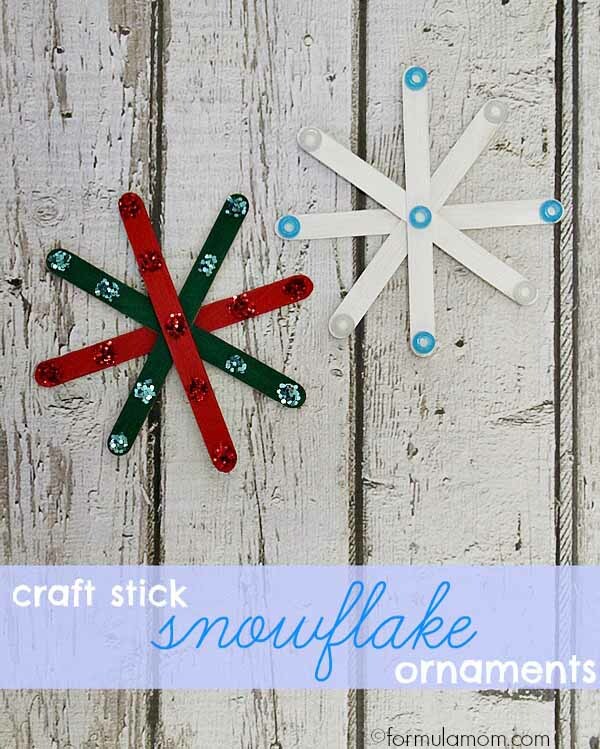 These snowflake ornaments only requires a little bit of effort to create. The materials are also affordable, so you could create as many as you want. Paint the craft sticks red and green for Christmas. Use glitters, stickers and other art stuff to decorate your snowflakes. They are glittering and sparkling. 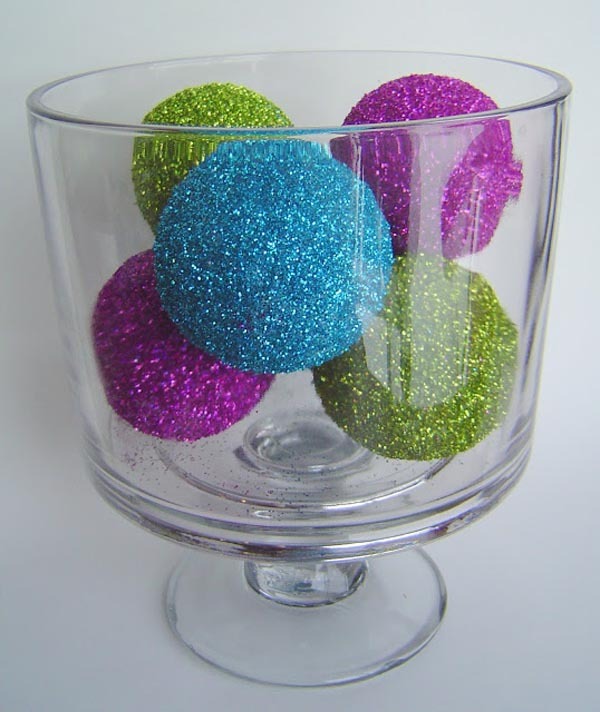 These glitter balls are easy to make with some styrofoam balls, glue and lots of glitters. To make the glitters stay on place, use spray adhesive or coat it with Elmer’s glue. Once they’re dry, place them in a truffle bowl for display. Help Mother Nature and decorate your house at the same time with this paper tube Santa Claus. Made from leftover cardboard tube of toilet paper, this project suits kids, age 7 and above. Some cotton batting to make Santa’s beard. Wiggle eyes make it more comical. Make your Christmas tree closer to heart with this easy initial ornaments. This Christmas decor can be made from lightweight materials like cereal or pizza boxes. Kids will surely enjoy painting their initials. Buttons, sequins and craft jewels to make it livelier. 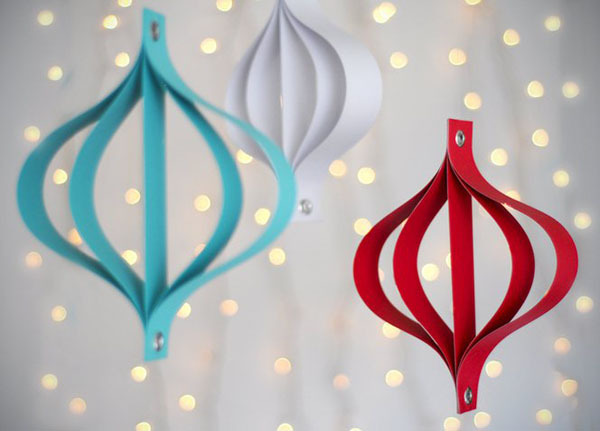 These Christmas tree hangers are simple and inexpensive. They are made from paper doily, adhesive and clothespin to hang it while your waiting for it to dry. Place the doily on a contrasting colored paper. You can make small and big versions of this decor. Candy bars transformed to become Rudolph the Red-nose reindeer is definitely enjoyable to munch on. Some few colored construction papers to dress the candy bars. Brown pipe antlers would be the perfect antlers. Googley eyes to complete the jolly look. Teach your kids the value of recycling while creating the perfect holiday memories. Let the kids paint the snowmen’s face while you stick the bottles together with hot glue. Red yarns for the scarves. Use silver or golden ribbon so you can hang it on your Christmas tree. To make it more eye-catching, paint three jumbo popsicles with mult-surface satin one. Once they have dried out, shape it into a triangle. Some cute tiny buttons to adore the tree. This Santa Claus made out from paper plate and other inexpensive materials would sure make the perfect bonding moment for you and your kids. This holiday project also teaches your kid the importance of recycling and practicality as well. Preschoolers can also learn more about shapes. It’s the perfect combination of a fun and educational activity at the same time. Yes, this Santa decor may be cheap but the shared experience creating it is definitely priceless. This handmade tags make your gifts more special. It also instill the value of recycling to your young ones. The soda can tab makes the perfect Santa belt. This Christmas tree made from paper chains would definitely make any door more welcoming. Have a wonderful time with your kids while making the chains. You could use construction papers or colored lightweight cardboard to make a sturdy piece. This Christmas ornament is not just affordable – it’s definitely fun to do. Completely cover the round craft ornament with black metallic paint to create the perfect backdraft. Tie some ribbons so you could easily hang it on your door or on your Christmas tree. Use different colors and shapes of buttons to make the candy cane. Your old jigsaw puzzle turned into something more appropriate for Christmas. One snowflake has six puzzle pieces. Other materials would be PVA glue to ensure that no piece would fall apart. Paint the pieces using white paint and don’t forget the reverse side as well. Use some silver or gold metallic ribbons so you could hang them on the Christmas tree. This Christmas wreath is not just an eye-catching piece but also mouth-watering as well. Teach your kids art and let them explore their creative side with this easy-to-do holiday craft. The wreath is made from bow tie pasta colored with green paint. Use a fancy red ribbon to add more color and Christmas spirit to this piece. Teach your kids the value of recycling as early as now with this lighted mason jar turned into a snowman. Use a pair of old gloves instead of throwing them away. Glue buttons on the jar to give it body and form. Some big wiggly eyes are the perfect match and definitely look more comical. Use some green and red fabric for the scarf. Paper plates turned into a reindeer are the perfect art project for the kids this Christmas. To make it more enjoyable, ask them to trace their hands onto a cardboard. Help them cut the trace and make it into the reindeer’s antlers. Instead of throwing those old worn-out socks, make them into a wonderful Christmas outdoor décor outside. Stuff each sock with other unused cloth items and fabrics. Stick some colorful buttons on it to make it more colorful. The colorful scarves are also made from recycled fabric. Make those coffee cups into a more cheerful tone this Christmas with vibrant cup holders. Made entirely from recycled materials, this art project teaches your kids the importance of reusing and recycling stuff. Old colorful socks would be for the jacket and some colorful contrasting-colored buttons as the embellishment. It gives the feeling of warmth and coziness. These food treat holders are not just for decorating purposes but would also make the perfect gift. Some nice and colorful scapbook papers cut out and glued together to make a pyramid. Decorate it with fancy ribbons to make it more enticing. Red or green yarn or even a metallic twine to complete this treat holders. Make those plain green Christmas balls into something more playful together with your kids. The metallic ones would work better with the Ninja Turtles design. Tie a colored ribbon around the ball for the character’s mask and for tying it on the tree. Glue the wiggly eyes on the mask and you’re done. Styrofoam cups dressed as snowman would make your front porch more wonderful. Use old gloves for the snowman’s cap. Allow your kids to draw this Christmas figure its face so that they could appreciate arts more. Fancy red or green ribbon will be its scarf. Snowball is one of the most popular Christmas craft done by kids during Christmas season. In the following step, you will be able to create your own snowball in no time.Prepare the following materials: light bulbs, string, glue gun, scissor, white paint, crayons, and colored felt. Paint the bulb at least two coats of paint. Make the hat of the snowball. Dry it first, then, glue the hat on the light bulb. Use a string to tie the hat. Paint the eyes, face, nose and cheeks of the snowball, then, hang it. Santa is a well-known entity for kids as the one who brings special Christmas gift to them during Christmas day. That’s maybe the reason why most kids love to make Christmas craft out of Santa. 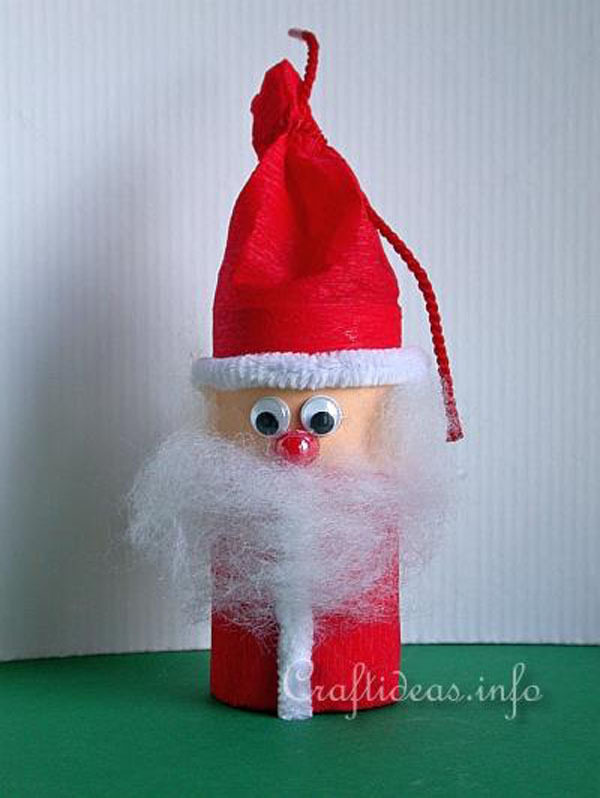 Here, we will guide you on how to make a simple Santa craft. This can be a nice Christmas tree ornament, having those Christmas hampers and gift baskets under it. So, let’s start creating handmade Christmas crafts. Cut the red felt to form a Santa hat and glue the pompom at the tip. Glue the hat to the tip of the stick. Paint two black dots under the brim of the hat. This will serve as the eyes. Glue the bead under the eyes. This will be Santa’s nose. Paint a smile under the nose with the black paint. Shred the cotton balls and glue them around the mouth. This will serve as Santa’s mustache. Paint the rest of the stick red. Draw a belt across the middle of the stick. You can glue a ribbon at the top to serve as your hanger. 1. Prepare the following materials: pretzels, ribbon, glue sticks and scissors. 2. Use a glue gun to provide all the pretzels together and form a circle. 3. Be sure that the second layer of the pretzels meets the central part, then into the bottom layer. 4. Hang the pretzels with a festive ribbon. Prepare the following materials: pinecone, sheet moss, dried leaves, ball, glue, paint, marker, ribbon, craft wire, spray paint, and thread. 1. Choose the best pinecone that has flat petals. Glue the dried leaves into pair, then, put decorations with the spray paint. 2. Add a layer of paint on the ball, and dry it. Then, you can draw the image on the ball using the black marker. 3. Stick the sheet moss into the ball. 4. Use a piece of wire to make a head of the angel. Use glue to stick on the ball. 5. Knot a thread at the back of the angel, then, hang it. You want another edible and colorful Christmas ornament? Then try making a sweet reindeer decoration. Prepare the following materials: candy cane, brown pipe cleaner, 2 little wiggly eyes, pompom, ribbon, little jingle bell, and glue gun. 1. Slice the brown pipe cleaner into two equal parts. 2. Set the two halves close to each other. 3. Put the wrapped candy into the pipe cleaner, then, squeeze it tightly. 4. Create two antlers for the reindeer, short and long antler, then, grip and twist it tightly. 5. Attach the eyes of the reindeer by using hot glue. 6. Put the pompom on the candy cane that serves as a nose of the reindeer. 7. Put some ribbons on the bottom side of the cane. Add a couple of jingle bells so that it looks more fair one. 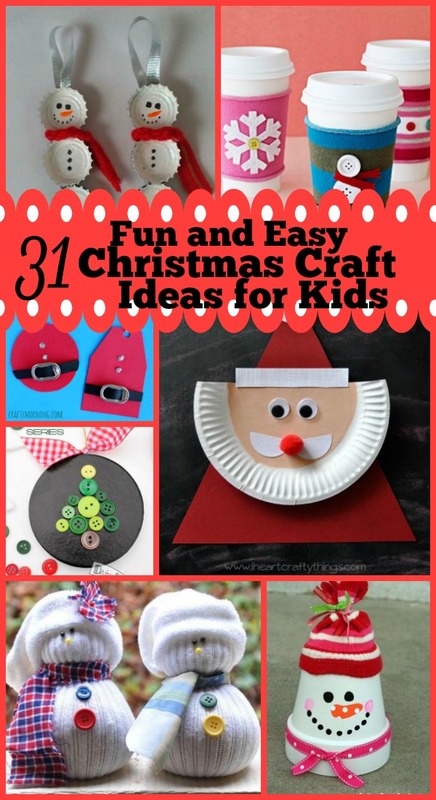 Those Christmas craft ideas mentioned above is fantastic activities for adults and children. So, try it now! Poinsettia is one of the most popular Christmas decorations that most people use as they decorate their home during holiday season. This is especially if you don’t have budget for expensive Christmas flower arrangement. It is best used together with birds, beads and Christmas light decorations. It can be a good ornament for Christmas trees as well, having different special Christmas gifts and and christmas items under it. It can also be a nice decoration for gift baskets and Christmas hampers. Now, let me share you this simple Christmas craft that can help you create your own poinsettia ornament. 3. Cut a square shape out of yellow art paper (2 x 2). Then, get 1 bead and wrap it with yellow art paper. Put the bead at the center of the square art paper, wrap then twist. Make at least 3 to 4 yellow décor. 4. Hold the yellow beads. Then, put the red and green leaves together. Twist the wires until it become fixed. You can tighten it by wrapping additional thin wires on the base of your poinsettia. 5. Add glittery touch to it by gluing glitters on the surface of the yellow beads. And there you have it! You can create as many poinsettia ornaments as you want and use it to decorate your doors, windows or Christmas tree!